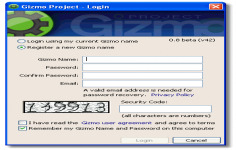 Gizmo Project is a great communication program on the Internet with many useful functions. 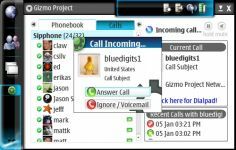 Gizmo Project is a software designed to perform calls via VoIP. The software includes several features that allow it to be just a communication center for the user. For this purpose, user can make calls, instant messaging, create chat rooms. The program is also able to integrate instant client messaging Multiprotocol AIM, GTalk and Yahoo compliant. Gizmo Project offers a great formula that allows the user to make external calls at low prices. In addition, he can send and receive files. In case where the user can not answer a call, the application has an autoresponder that will keep the messages. Thus, through its interface, view history of all calls will be easier. To add the IM accounts is very easy with just a click on the contact named "Add AIM, MSN, Y buddies" then typing "help" in the chat window.